Naissance : 30 octobre 1957, à Moscou, Russie, Union soviétique. Sélection : 3 mars 1992: douzième sélection de cosmonautes sociétiques civils. Total : 185 j. 01 h. 41 min. DATE AND PLACE OF BIRTH: October 30, 1957, Moscow, Russia. Father: Ivan Pavlovich Lazutkin (1919-1992). Mother: Zinaida Evgenievna Lazutkina (Yanovskaya). EDUCATION: IIn 1981 he graduated from Moscow Aviation Institute after S. Ordzhonokodze (MAI). He specialized in the following: Flight vehicles mechanical equipment, mechanical engineer. In 1985 he finished the State Central Courses for Foreign Languages Tuition by correspondence (English department) and in 1987 he finished the English language course at the Institute for advanced studies of top-level officials and specialists. Wife: Ludmila Vladimirovna Lazutkina (Gorodnitskaya), born in 1961. Dangheters: Natalia, born in 1984 and Evgenia, born in 1989. AWARDS AND RANKS: Hero of the Russian Federation (1988), Pilot-Cosmonaut of the Russian Federation (1988). Decorated with Gold Star medal of the Hero of the Russian Federation and NASA medals for Space Flight and Public Services. SPORTS ACHIEVEMENTS: Master of sports in sports gymnastics, a 1-st grade in parachute sport, a 2-nd grade in parachute all-round competitions. WORK EXPERIENCE: From September 1975 to March 1981 he was a student of MAI. Since April 1981 he had been the MAI engineer. From November 13, 1984 to the enlistment in the cosmonaut detachment he was an engineer, 2-nd category engineer of GKB NPO Energia. He took part in the following: the crew training, development of programs for the operator training on dynamic stands and cosmonaut training under the extravehicular activity program. 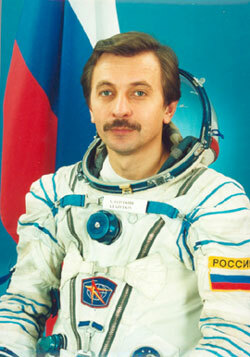 On May 13, 1992 he was enlisted in the cosmonaut detachment of NPO Energia as a candidate for test cosmonauts. From October 1992 to February 1994 he passed a course of general space training at Yu.A. Gagarin CTC. 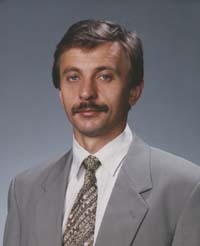 On February 25, 1994 a qualification of a test cosmonaut was conferred on him by decision of the Interdepartmental Qualification Committee and on June 16 he was appointed test cosmonaut. From April 18 to January 31, 1996 he passed training for flight as the backup crew flight engineer under PC-21 program on the Mir Station. From March 25, 1996 to January 1997 he passed training for flight as the prime crew flight engineer under PC-23 program on the Mir Station. From February 10 to August 15, 1997 he performed the first space flight as the Soyuz TM-25 transport spacecraft and Mir Orbital Complex flight engineer under PC-23 program together with V. Tsibliev, J. Linenger, M. Foale (USA) and R. Ewald (FRG), PC-22 crew: V.Korzun and A. Kaleri and also with the crew of the Atlantis Space Shuttle (STS-84). The flight duration was 184 days 22 hrs. 07 min. 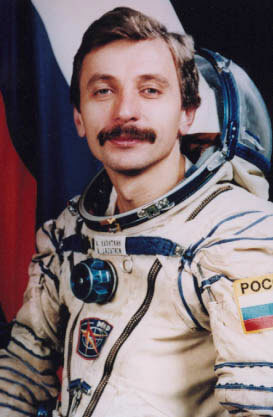 41 s.
Since March 25, 2002 he has been passing training for space flight as the backup crew flight engineer of the Soyuz TM, Soyuz TMA transport spacecraft, 4th visiting crew under the ISS program, together with crew commander Yuri Lonchakov.